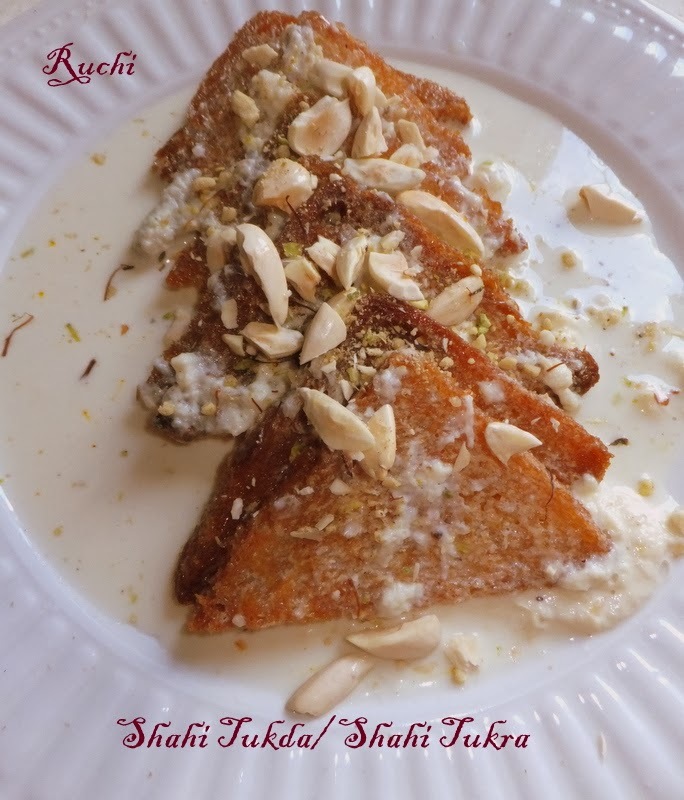 Shahi Tukda/ Shahi Tukra is a very exotic, a rich dessert that originated in the royal Mughal kitchens as a way to use up the left over bread from the emperor’s meals. And It is very popular in Hyderabadi cuisine, served at weddings and parties. It's simple to make and a great dessert and that can be easily made at home. When fried bread slices are soaked in warm milk with cardamom, saffron and sugar for enriched flavor and garnished with nuts is a royal treat to taste buds at anytime. . This dessert is one of my all time favorite Sweet dish. 1.First cut the edges of the bread. Thereafter, cut it diagonally to form 2 triangles& keepaside. 2.Place milk in a thick bottomed pan and bring to a boil. Reduce flame and allow it to reduce to ¼ of its original quantity. 3.Keep stirring the milk continuously from time to time. Now, add pista and few strands of saffron to the thickened milk. 4.In another bowl, place water and sugar. On low to medium flame, let the sugar dissolve completely. Add ½ tsp of Saffron. Once it dissolves completely, allow to cook for 2 minutes. Turn off heat. Keep aside. 5.Now Heat a pan, add ghee. Once it's hot, place all the bread pieces and fry over slow flame. After couple of minutes, flip to the other side. Fry the bread pieces to a golden shade on both sides. Remove and place on a plate. 6.Dip each bread piece in the sugar syrup to coat both the sides and remove onto a serving dish. 7.Arrange the fried bread on a plate. At the time of serving, pour the thickened milk over the bread slices, garnish with toasted nuts and saffron strands over it and Serve Warm or Chilled. Yummy Shahi Tukda is ready... Enjoy! 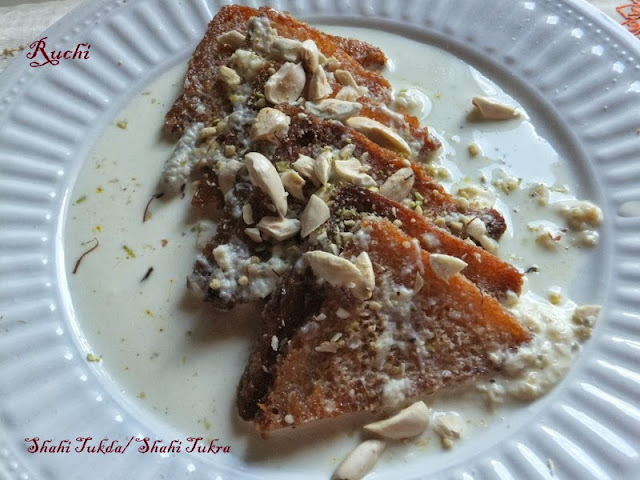 Incredible and terrific shahi tukda,cant resist.